Off in the distant, sandy expanse of the Lost Desert lies a tournament field testing the strength of Neopian challengers day and night. Are you ready to face the challenge of Tug 'O' War? There are two modes to this game. You may challenge a friend in 2-player mode, or you may challenge the champions of the Lost Desert in 1-player mode. Regardless of your choice of mode, you'll have to select a Desert champion to support for the duration of the tournament before play begins. You can find a list of the champions under the "Players" heading of the guide. In 1-player mode, you'll use the W, A, S, and D keys to maneuver your character as you try for victory. To pull your opponent towards the river, press A repeatedly, as fast as you can. Whoever manages to pull their opponent into the river wins and advances to the next round of the tournament! Simple, right? Perhaps not. With each successive victory, your opponents will become stronger and faster, and it'll take some skill to pull them into the river. (Although, they seem to be less strong than they were in the previous version of this game.) You won't have to rely solely on your fast-tapping skills, however. There are two additional tools in your arsenal: the Rage Bar and the Super Pull . Each time your character is pulled toward the river by your opponent, your rage increases. This is shown in the rage bar at the bottom of the screen below your character. When your rage bar is full, simply press the W key to unleash your fury. Your character will stomp on the ground with enough force to make your opponent dazed. You can then jump on the opportunity to pull your frozen opponent closer to the river. The bar at the top of the screen serves as a timer for the Super Pull. When it shrinks to the center, you'll see four keys pop up on each side of the headdress in the center. All you need to do is press the keys in sequence faster than your opponent. There'll be four sets of four letters; type them all in before your opponent does, and you'll drag them towards the river. Careful, though--if you're too slow, you'll be dragged toward the river! 2-player mode works essentially the same way as 1-player mode, only there's just a single round, and you won't earn any Neopoints from it. Player 1 uses the same controls as above, while Player 2 uses the arrow keys. 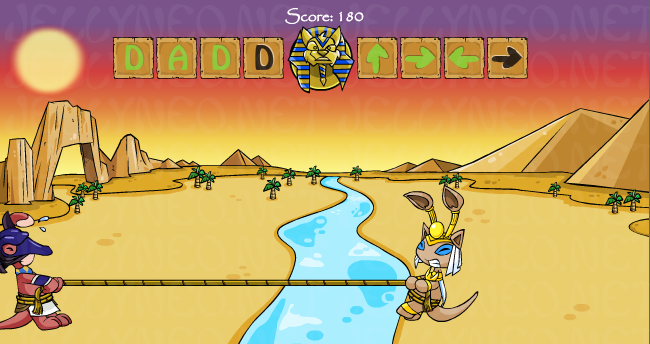 Instead of A to pull, the second player uses the Right arrow key, and the super pull works the same way, only with sequences of arrows instead of letters. If you prefer to use different keys, simply head over to 'Keyboard Settings' in the menu to change them. These are shown in order of increasing difficulty. Note, however, that it doesn't matter who you pick--the four levels of difficulty will be the same regardless. There are also two bonus characters you'll have to face if you can make it past the first four. The first of these is a Grundo called Truggdon, and he's quite a tough opponent. Last of all, you'll get the sneaky ??? as an opponent. Some believe this mysterious Jetsam is actually Spectre, from Cheat!. ??? was purple in the first version of the game. Now that he's red, he looks a lot more like Spectre. There's not too much strategy involved in Tug 'O' War, as the main idea is simply to press a key as fast as possible. There are a couple of things to think about, however. If your fingers are prone to getting tired, you may want to use your non-dominant hand for the first couple rounds to save your faster fingers for the tougher opponents. Similarly, you may find that you're not quite fast enough on the Super Pulls as the opponents get progressively faster. Here's a trick to think about: simply press your four keys over and over again in succession as fast as possible, without even thinking about which keys you're pressing. You'll hit the correct ones eventually, and probably faster than you might if you were thinking about each one in turn. This way, you can beat even Truggdon and ??? to the punch and secure yourself a faster victory. Lastly, make sure to take advantage of the Super Pulls and the Rage Bar. You get bonus points if you pull your opponents into the river quickly, so if you're looking for a trophy, make sure your typing is at its fastest. Good luck!